The goal of the ACL Reconstruction surgery is to reconstruct or repair the ACL tear, thus, restore the knee stability and function after a knee injury. It is also performed to prevent degeneration to other knee structures. The ACL reconstruction has an impressive success rate, however, some patients may still experience knee instability and knee pain after the surgery. In those patients, a second ACL reconstruction, known as revision ACL reconstruction, is usually recommended to repair the existing knee problems. While most patients return to their normal and active lifestyle in a few months after the surgery, there are still patients that struggle with the consequences of the ACL tear over a longer period of time. And that is until they meet the right knee surgeon and specialist. Casey Brooks, a vivid sports enthusiast and kids sports teacher, had been struggling with painful knee injuries for a long time when she visited Manhattan Orthopedic Care. She had an appointment with Dr. Armin Tehrany because of the ACL tear issues in her left knee. The number of knee treatment she had already undergone, shocked Dr. Tehrany and the team: she already had four knee surgeries out of which three have been performed on her left knee and two ACL reconstruction surgeries. After Dr. Tehrany examined her knee, there was no doubt that Casey required another ACL reconstruction. 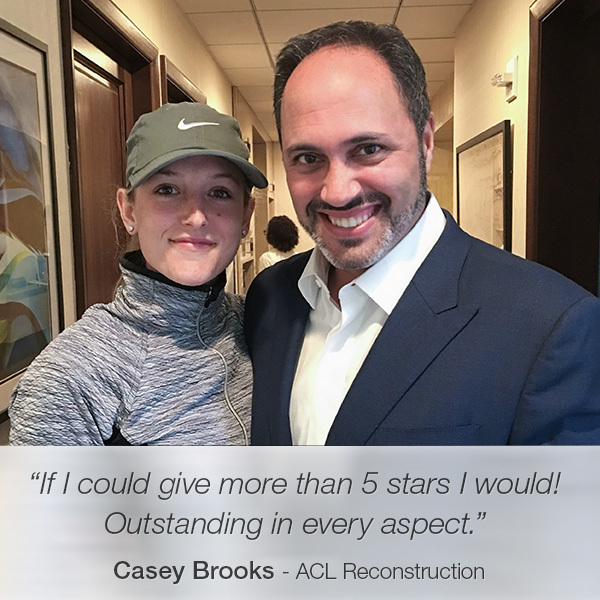 Casey was petrified with the fact that she might not be able to feel her knee as strong as before she tore the ACL, but Dr. Tehrany’s knowledge and professional demeanor gave her hope that this could be her last ACL reconstruction. Fortunately, it was. Dr. Tehrany successfully performed the revision ACL reconstruction and the recovery process was smooth and stress-free. If I could give more than 5 stars I would! Outstanding in every aspect. The office, associates, and Dr. Tehrany are always friendly and welcoming, not to mention professional and accommodating to the patient’s needs. I saw Dr. Tehrany for what would be my 5th knee surgery, 3rd ACL reconstruction and 4th surgery on my left knee. He did everything possible to ensure not only that I would return back to normal again but that we would do everything possible to avoid any further injuries. Each office visit was thorough and never rushed.